The Everglades is much more than a Florida landmark. It is an International Biosphere Reserve, a World Heritage Site, and a Wetland of International Importance that supports world-renowned fresh and saltwater fisheries. However, nearly a century of poor water management has severely impacted the Everglades and its adjacent estuaries. Harmful water discharges from Lake Okeechobee has caused algal blooms and fish kills in the St. Lucie and Caloosahatchee estuaries, while a lack of freshwater flowing south to Florida Bay has resulted in the loss of nearly 50,000 acres of seagrass in 2015. Since 2015, the IGFA has focused its efforts on educating the public about this issue and advocating for the construction of the EAA reservoir south of Lake Okeechobee. 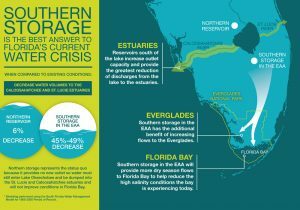 While only one component of the Comprehensive Everglades Restoration Plan, the EAA reservoir has the ability to alleviate current problems associated with the Everglades’ eastern, western and southern estuaries. During the rainy season, the reservoir will draw down Lake Okeechobee, where the water will be cleaned and stored. This will prevent the need for massive discharges of poor-quality water from Lake Okeechobee to the Caloosahatchee and St. Lucie Estuaries. The reservoir will also send water south through the Everglades to Florida Bay during the dry season and/or periods of drought to prevent portions of Florida Bay from experiencing periods of hypersalinity that cause seagrass die offs. State and federal funding are necessary for the construction of the EAA reservoir. SB-10 was signed into law on May 9th , 2017 and provides $800 million in state funding to create the EAA reservoir. In October, 2018, President Trump signed the America’s Water Infrastructure Act of 2018 into law, which included the federal authorization of the 16,000-acre reservoir. It’s now incumbent on Congress to appropriate the $200 million annually that is needed to construct the reservoir and progress other Everglades restoration projects. This is much more than a Florida problem. The Everglades and the fisheries it supports are a destination for visiting anglers from around the world. As such, the IGFA will continue to work on this important issue by advocating at the federal and state level to ensure that funding is provided for these important restoration projects and that they are implemented as quickly as possible and in the intended manner to help restore the Everglades, fix our water quality issues and prevent further damage to these world-class fisheries. The IGFA is also a founding member of the Now or Neverglades Coalition, which is a body of like-minded organizations working collectively to advance Everglades restoration. Learn more about this important issue, sign the Now or Neverglades Declaration and get involved by visiting the Now or Neverglades coalition website.